Jess Culpepper fell in love with Benton Mason in ninth grade and married him as soon as she graduated from college. Six years later, Jess is thinking about babies, but Benton is regretting his lack of experience and acquiring what he missed with the help of a florist. Six months later, Jess is eyeing her divorce papers and longing to escape Morning Glory, Mississippi, where reminders of the last fourteen years of her life as part of Jess & Benton lurk everywhere. A nursing job in Pensacola, Florida, is just the opportunity she is seeking. Ryan Reyes, a prepubescent nerd who graduated from high school at fourteen, was in his former life known as The Brain at Morning Glory High School where he served as the target of cruel tricks at the hands of football star Benton Mason and nourished a crush on kind-hearted cheerleader Jess Culpepper. Ryan went on to earn an MD and a PhD, but when he sold a scaffolding for stem cells to a biomedical company, he left his Caltech lab and reinvented himself as a laid-back owner of a fishing charter service and a champion player on the beach scene in Pensacola. Jess meets a drunken Ryan on the beach, but even after a second meeting when he apologizes, she doesn’t recognize him. She may have lingered in Ryan’s memory as a fantasy figure, but she never guessed that the hapless nerd known as “Jess’s puppy” would turn into the kind of hottie of whom women dream. Neither Jess nor Ryan is looking for a relationship, and thus they agree to be friends who enjoy spending time together. Predictably, the chemistry between them ensures that they are soon more than friends. Jess returns to Morning Glory for Rosemary Reynolds’s wedding to Sal Genovese (Charmingly Yours), and Ryan reluctantly accompanies her. The trip stirs old memories and painful insecurities and threatens their developing relationship. Can their second chance survive their pasts? 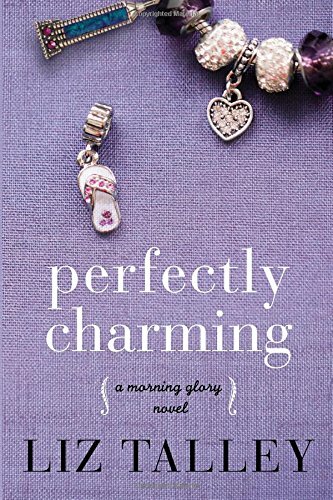 The second book in Liz Talley’s Morning Glory series is just as charming as the first. I couldn’t resist the play on the charm bracelet that links the books in the series, but the description is an accurate one. Jess and Ryan are likeable, vulnerable, complicated characters who delight the reader. The nerdy hero is a favorite trope, and this one, combined with a self-makeover, is a refreshing take on the popular theme. The story blends humor with a substantial emotional punch, and Talley’s voice is, as usual, distinctive and appealing. The characters are young, but they are adults—and not lightweights either. Perfectly Charming is a winning mix of the funny and the poignant. I highly recommend it. The book can be read as a standalone, but why deny yourself the pleasure of reading both Charmingly Yours and Perfectly Charming? I’ve been reading Liz Talley since her Boys of Bayou Bridge series five years ago, but I think this is her best series yet. I eagerly await sweet Eden’s story. I don't know why I haven't read her books--they sound delightful! I'll be checking out both of the Morning Glory books. Great review! Talley really is a terrific writer, Nikki. I hope you enjoy the Morning Glory books as much as I did. I love introducing authors whose books I love to new readers. I hope you will enjoy the books. I love the charm bracelet on the cover. For that alone I would pick up the book to read it. Great review. Isn't it a great cover? Thanks for the kind words, Pamela.